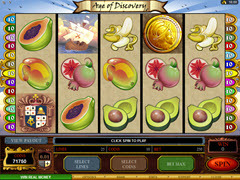 Age of Discovery is an online video pokie game created by Microgaming. The game puts you on an old ship that is searching the world for new places to discover. This pokie has 25 paylines, 5 reels and game features that all help increase you’re bankroll. You will notice wild symbols, a scatter and a bonus game. The theme of this game is centered on global navigation and will take you through the romance and history of the sailors who discovered the lands that we live on today. The coin denominations in this game range from $0.50 to $0.01 per payline. You can then choose the amount of coins you want to wager, up to ten coins per payline, which equals up to 250 coins per spin. The maximum wager in this game is $125 a spin while the minimum bet in this game is $0.25. This game comes with stunning graphics, superior sound quality and state of the art game performance. Some of the slot symbols that you will see in Age of Discovery are Mangos, Ship, Star Fruit, Bananas, Pomegranates and so many more. The symbols you want to land on though are the sea dragon, ship compass and gold coins, as these take you to the special features included in Age of Discovery. 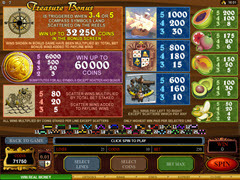 There are three different in game features available for this pokie game. The first in game feature that you will notice is the scatter symbol. You will need to land on three or more of these symbols in order to receive the multiplier. The multiplier will times your original wager by five, 4 of the scatter symbols will pay you twenty times the amount of your original wager and then five scatter symbols will reward you with the payout of 80 times the amount of your original wager. The wild symbol in this pokie game is the gold coin. This slot symbol will replace all the other symbols in the game except for the scatter symbol. This symbol will provide the players with a prize of three coins when they land on two of the wild symbols, fifty coins when they land on three of the wild symbols, 500 coins when they land on four wild symbols and finally 6000 coins when they land on five of these wild symbols. The bonus game is called the Treasure Bonus Round. When you land on 3 or more of the ship compass symbols on any of the reels then you will be sent off to the bonus round. The bonus round will let you choose from thirty different locations from all across the world. Each location that you choose will let you dig up some old treasure. This will allow for you to win thousands upon thousands of coins within this game. Overall, we have found that this is an interesting pokie, one that almost gives you a lesson in navigational history. The colors, graphics, features all come together nicely and provide some great entertainment value.